Montana's Central Role in the Repression--and Eventual Recognition--of Free Speech,"
As U.S. troops fight in Iraq, Montanans heatedly debate whether we should be engaged in that war. This robust discussion is exactly as it should be in a country that has enshrined the right to free speech in its Constitution's Bill of Rights. But the ability to comment candidly, in speech and writing, on this country's policies should never be taken for granted. 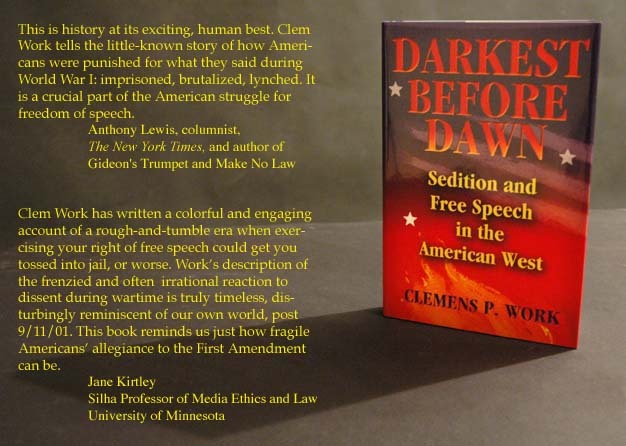 Clemens P. Work's excellent new book, Darkest before Dawn: Sedition and Free Speech in the American West, describes in absorbing detail one of the darkest eras in Montana history in which dissenting voices were stifled. During World War I, some Montanans opposing U.S. involvement in the war and those immigrants expressing pro-German, anti-American sentiments in beer halls found themselves arrested. Seventy-four Montanans -- all but one of them men -- were convicted of sedition. Forty of these men and the one lone woman served sentences of up to 20 years at Montana State Prison in Deer Lodge and faced fines of up to $20,000. 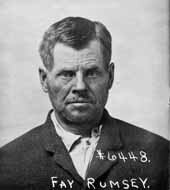 Montana's frightening Sedition Act, enacted by a special legislative session and becoming law Feb. 22, 1918, became a model for the Federal Sedition Act, which was enacted May 16, 1918. The language defining sedition in the federal law is identical to the Montana law except for three words. It is a shameful, frightening yet fascinating story. Yet it's one many Montanans know nothing about. It should be taught in our schools at all levels so we don't repeat the mistakes of our past. The book, published this fall, is a well-written, fully documented history of the period. It sets the stage for what happened here, describes the terrifying events and puts the Montana era in a national context. Work, director of graduate studies at the University of Montana School of Journalism, weaves a compelling story about what led to the dissenting voices. Western Montana's two major industries then were mining and timber, which faced an insurgent labor movement upset over unsafe working conditions and low wages. The radical labor group, the Industrial Workers of the World, or Wobblies, helped stir the pot. Miners walked off the job at the Anaconda Copper Mining Co.'s Speculator Mine in 1917 after a fire killed 168 workers and exposed dangerous, illegal working conditions. The powerful Anaconda Copper Mining Co. dominated Montana economically and politically as few corporations ever have nationally. Its copper was a critical product in the war effort. The Company had the ears, if not the souls, of most of the state's leading politicians. It also either owned, or had in its pocket, most of Montana's major daily newspapers. The United States entered the war in 1917. By no means did all Montanans embrace the idea. Many German immigrants saw no reason for the United States to fight against their homeland, nor did all Irish immigrants support this country bailing out Great Britain. Dissent was not tolerated in Montana as a wave of super-patriotism spread. Besides passing the Sedition Act, a special legislative session emboldened the Montana Council of Defense, previously a minor group urging people to grow gardens and buy bonds. The Legislature granted the council the extraordinary power to pass virtual statewide laws. The council soon banned German books and forbade the use of the German language here, even in the pulpit, driving Mennonites into Canada. The council encouraged neighbor spying on neighbor, with the full encouragement of spineless politicians, with a few exceptions such as U.S. Attorney and later Sen. Burton K. Wheeler and U.S. District Judge George M. Bourquin. 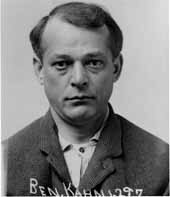 The Montana press followed the council in lockstep, with a few courageous exceptions such as William F. Dunn, fiery editor of the Butte Bulletin, a labor paper. Work said most sedition convictions in Montana were based on "offhand outburst, often in saloons," usually by blue-collar workers, many of them immigrants, often using foul language. Among those reading Work's book with keen interest is Gov. Brian Schweitzer, whose grandparents were German-Russian farmers who immigrated to Montana nearly a century ago. "What made this country great is the melting pot because we accept a lot of different nationalities,"Schweitzer said. "They came here because they wanted to be here. Most were like my grandparents. They came here because they had nowhere else to go. "Asked if he might issue posthumous pardons to some Montanans convicted of sedition nearly 90 years ago, Schweitzer said he hadn't thought of it. Then he said, "Why not? I will look into pardons. This was a time of some pretty mass hysteria. Why not clear the names of some of the people?" Clemens Work, journalism professor, relentless researcher, brevet lawyer, and accomplished writer, has turned the darkest pages of Montana history to teach us once again, and forcibly, the vulnerability and the resiliency of the liberties we take too much for granted. His focus is on the assault on free speech occasioned by the patriotic miasma endemic to Montana during World War I, but the breadth of his essay encompasses far more than the violation of that entitlement. It is perhaps the best accounting of the war between the feudal Anaconda Copper Mining Company and the radical labor movement (marching under the banner of the Industrial Workers of the World). It is also a primer and cautionary tale on ho liberty can be sacrificed for security during a national crisis. Examining critical Montana events preceding, during, and immediately after the "war to save democracy," Clemens fairly and accurately describes the conflict between the corporate kings and the newly militant and effectively led men and women working in Butte and its mines. The complex scenario includes murder, dynamiting, ruthless Pinkerton operations, corrupt and gutless politicians, lawless courts, outrageous abuse of legal process, vigilante activities under the guise of legal and illegal "councils of defense," rigged and unconstitutional legislation, unconstrained impeachment proceedings and conviction of a judge in his absence, Nazi-like burning of books, legitimized suppression of opinion, neighbors spying on and accusing neighbors--all of which were either ignored or condoned by a corrupt and captive press. But this chronicle is not one of unrelieved mendacity. There are a few heroes: a fearless federal judge dedicated to the rule of law; an equally dedicated U.S. attorney who remained unflappable and defiant o the face of all manner of influence, threats, and pressure; and a state attorney general who remained true to his oath and the law. For the most part, however, public sentiment endorsed the egregious violations of law, decency, propriety, and good sense by their active support or supine indifference. 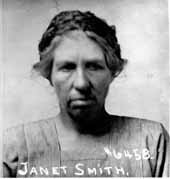 The ultimate insult to the state's prestige and the nadir of public responsibility was the enactment of Montana's criminal sedition statute in February 1918, which was duplicated, essentially word for word, by the federal government in May of the same year, just in time to "save" American citizens before the conclusion of the war in November. The acts made it a crime to express disapproval of just about anything involving the government during a time of war and provided a fine of up to twenty thousand dollars and a prison sentence of up to twenty years. Under this act, later repealed in Montana and found unconstitutional by the U.S. Supreme Court, seventy-nine Montanans were convicted of sedition and forty-one of them imprisoned or fined or both. Governor Brian Schweitzer pardoned all in 2006 after Work and his Montana Sedition Project assembled the necessary documentation. This rich and disgraceful history is as timely as it could be. The U.S. and many other countries are faced with a time-limitless crisis, international terrorism. The measure of our dedication to the freedom we so fervently profess will be the manner and degree to which we defend that freedom against the demand for measures of oppression in the name of security. As Work's chronicle of abuse suggests, Montana may well have been the leader in such measures during World War I. With this experience as a guide, Montana should provide leadership during the continuing crisis that apparently lies before us by demonstrating and adhering to a rational balance between security and liberty. 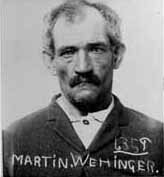 When the U.S. Congress passed the Sedition Act of 1918, a vaguer but potentially more repressive law than the Espionage Act of 1917, it was enacting an almost exact replica of the sedition law adopted eleven weeks earlier by Montana (in the federal version two words were omitted and one changed). The state law was the culmination of an antiradical campaign that sought explicitly to limit free speech. Supporters of the Montana law claimed, among other things, that it showed the state government's resolute loyalty and that it relieved patriotic citizens of the need to take vigilante action against "slackers" and German sympathizers. The patterns of suppression around World War I have been well studied by historians during the last forty years. The value of Clemens P. Work's book lies in the depth of local information it provides and the connections it makes between local anti-German or antiradical reaction and the regional and national temper. The German language and German culture were suspect everywhere, but constraints upon them in schools, libraries, and churches went further in Montana than in other states. Political violence occurred in many parts of the United States, but Montana was especially unruly. Local politicians and journalists grouped into pro- and antiwar camps, as mining interests, organized labor, and anarchism fanned the flames. Representative Jeanette Rankin excepted, the state's delegation in the U.S. Congress led the call for a nationwide crackdown on sedition. In many respects, then, the collisions between nativism and superpatriotism, on one hand, and free speech and dissent, on the other, during World War I were played out most vividly in Montana--according to Work, the state "was both a microcosm and a crucible of these tragic events" (p. 2). The U.S. Justice Department watched the legal and political maneuverings in Montana closely. While the state's only U.S. district judge and the U.S. district attorney, future senator Burton K. Wheeler, were reluctant to jail dissenters under the federal Espionage Act or Sedition Act, state officials readily made up for this by promiscuous application of their own version of the latter law. 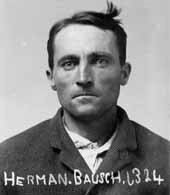 A number of individuals, many of them German immigrants, were sentenced to several years in prison for little more than what Work calls "emotional outburst[s]" (p. 208). He has developed a website, the Montana Sedition Project, examining the plight of those imprisoned for disloyal utterance. On May 3, 2006, as a result of Work's book and further research by University of Montana law students, Governor Brian Schweitzer of Montana issued posthumous pardons to seventy-five men and three women convicted under the state sedition law. Work (a professor of journalism) is interested in the ethical standards of sections of the press during World War I, as well as the treatment of editors, and the meaning of freedom of speech becomes a central theme of the book. The Montana experience is adeptly connected to the wider legal debate before and during the war, and subsequent judicial interpretation. The violent background of western labor relations and the unionizing struggles of the Industrial Workers of the World and the Metal Mine Workers Union provide a vital context for the wartime repression. Montana was unrepresentative of the United States as a whole, in the sense that no state went quite as far in its limitation of free speech in this era. And yet, because Montana displayed so starkly the wartime reaction, the influence of big business in politics, and the polarization of public opinion in the West, it is impossible to ignore its history. Work's well-illustrated narrative is engaging, although it is sometimes more judgmental and adjectival than necessary. His book conveys the humanity of those caught up the sedition mania, without losing sight of drier constitutional issues. This study is thus a welcome addition to scholarship on war and American society.